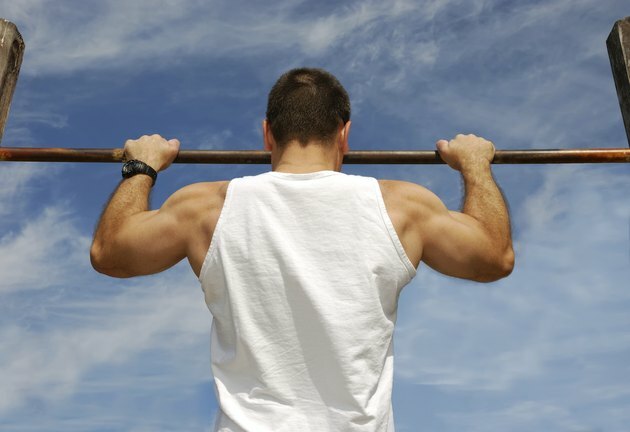 Pull-ups essentially provide a full upper-body workout in one exercise. Not only are multi-muscle, also called multi-joint, exercises more efficient time-wise, they burn more calories than single-muscle exercises, making them better for weight loss. 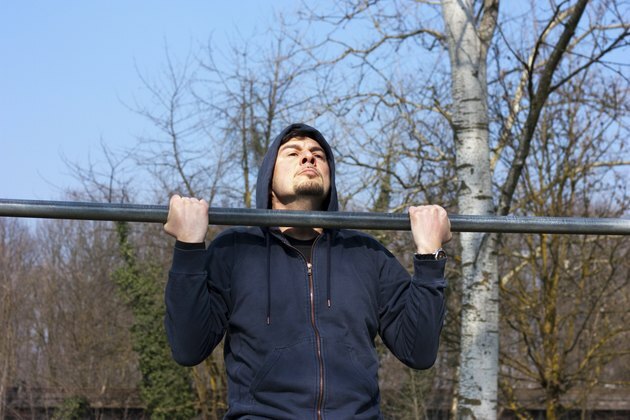 While pull-ups do work your biceps, no one exercise repeated over and over is "enough." 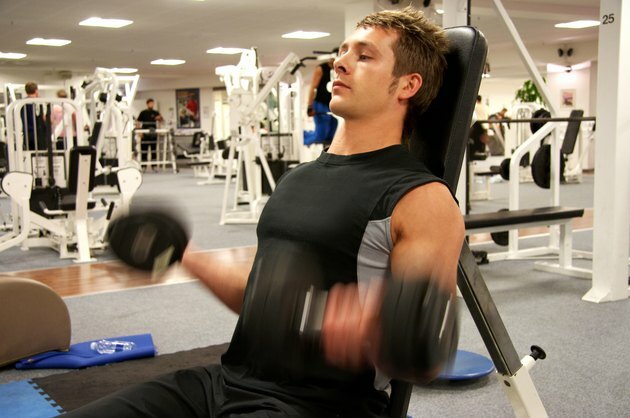 Muscle growth requires the constant challenge of added weight and varied movements. As you pull up, your shoulder blades come down and together. This action mainly involves the contraction of the latissimus dorsi of your middle back. Consequently, these are the muscles that get the most work. However, they don't kick in until the end. When you initiate the pull-up it uses the pecs in your chest and the middle and lower trapezius muscles that run along your spine and attach to your shoulder blades. Your biceps also kick in later in the move as you pull your elbows down and slightly back to raise yourself. Hand placement makes a big difference in how much your biceps are worked. The standard pull-up is done with your palms facing away from you. Turn them around to face you, and you have an exercise by a whole different name -- chin-ups -- though the muscles involved are pretty much the same. However, chin-ups provide a little more work for your biceps. This is because your elbows pull straight down, rather than out to the sides as they do with pull-ups, which is a weaker position for biceps. Further, trainer Charles Poliquin points out that close-grip chin-ups will emphasize the biceps even more, while close-grip pull-ups emphasize the brachialis that runs along the sides toward the bottom of your biceps and brachioradialis of your forearm. Building muscle requires progressive overload. As both pull-ups and chin-ups make use of your body weight, to up the challenge, you need to do more sets and repetitions, or you can add weight with a weight belt. You also need to challenge your biceps with different moves. You can alternate your multi-joint exercises between chin-ups, pull-ups and inverted rows with an underhand grip -- that also work the lats and biceps -- either each session or after four to six weeks of doing one exclusively. "Medicine and Science in Sports and Exercise," a paper published by the American College of Sports Medicine in 2009, states that strength training programs should include both single and multi-joint exercises. So, in addition to multi-joint exercises, add some biceps-specific exercises such as biceps curls with a barbell, dumbbell, cable machine or levered biceps curl machine. Mix unilateral with bilateral lifting.